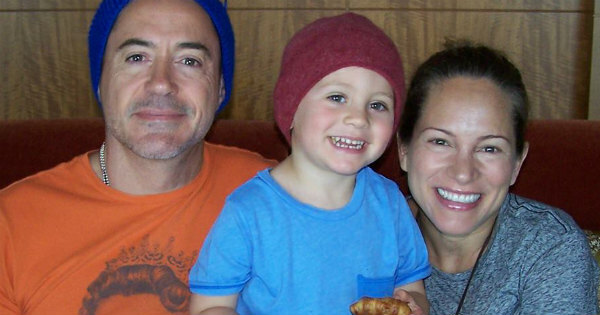 Robert Downey Jr and wife Susan have welcomed a baby girl into the world – and the actor marked her arrival with a very sweet message. “After nine months of intensive development, Team Downey is pleased to announce our 2014 fall/winter project,” he posts on his Facebook page. “Principal photography commenced 11-14 and will continue until she says, ‘Dad! You are embarrassing me … I’m 30, this has gotta stop’. Congratulations to the happy couple, who also have a two-year-old son, Exton Elias (pictured above with his mum and dad). Downey Jr also has a 21-year-old son, Indio, from a previous marriage. I’ve always had a soft spot for Downey Jr, and this cute birth announcement has just made me like him even more! Can’t wait to see photos of the family’s new addition, whose first name means “wise and noble leader”, according to QuickBabyNames. How did you announce your baby’s arrival?